The 2018 fresh blueberry season has ended. Frozen blueberries, raspberries and blackberries will be available all fall and winter and beyond for your enjoyment. Thanks to all of our wonderful customers who traveled near and far to visit us, our family and staff truly appreciate your business! Why Blueberries? : Blueberries are high in vitamins and antioxidants. 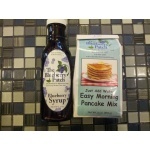 In fact studies have shown that the blueberry is the leader in Total Antioxidant Capacity (TAC). While rich with Vitamin C, manganese and dietary fiber, the blueberry remains low in calories, sodium and has no cholesterol. A great addition to any diet . As Ohio's Premier Blueberry Plantation, The Blueberry Patch propagates hundreds of thousands of new blueberry plants every year. Countless farms and home gardens have purchased their plants right here at our nursery. Come, browse North Central Ohio's most unique and complete gift shop! With over 4,000 square feet of gifts and home decor to explore, you’re sure to find gifts for any occasion. Including a variety of fine jewelry, handbags, baby gifts & candles. Many items are made right here in USA and Ohio! Built inside a greenhouse, and attached to our gift shop, come enjoy a meal while surrounded by flowers, plants, fountains, and gifts. © 2006-2019 The Blueberry Patch.